Anyone who has ever been in my house knows that I am not on the decluttering band wagon. I am a collector of stuff. Especially baking stuff. Most of my collections are at least occasionally useful. All of my collections bring me joy. The problem with collections is figuring out how and where to store them. Some collectors have to figure out how to store big things like cars, paintings, and wild animals. I just have to come up with a plan to organize my cookie cutters in my overflowing kitchen drawers, my Nordic Ware pans in my overflowing kitchen cabinets, and my rainbow colored hoard of sprinkles. All suggestions, short of an intervention, are welcome! My cookie cutter collection has built up slowly over the years when I baked for and with my kids. Just about every holiday imaginable is represented by the shapes in my cookie cutter drawer. In the past few years, I have built up my collection with sets of basic shapes (squares, circles, rectangles) in a variety of sizes. I’ve also been drawn to mini cutters. They are just so cute! Tiny little one bite cookies, like Bite Sized Sugar Cookie Nibbles. 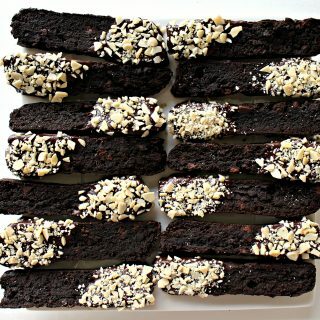 Center cut outs for sandwich cookies, like Chocolate Mint Sandwich Cookies and Honey Graham Sandwich Cookies. Adding dimension on top of a cookie base, like 3-D Turkey Cookies. 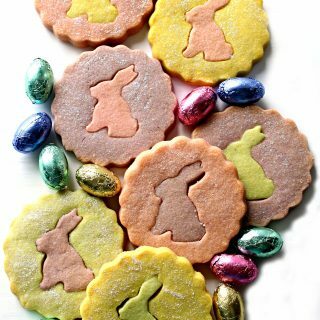 Easter Bunny Shortbread Cutout Cookies get their multi-colored puzzle look from a mini bunny cookie cutter (about 1.75” from ear tip to cotton tail). 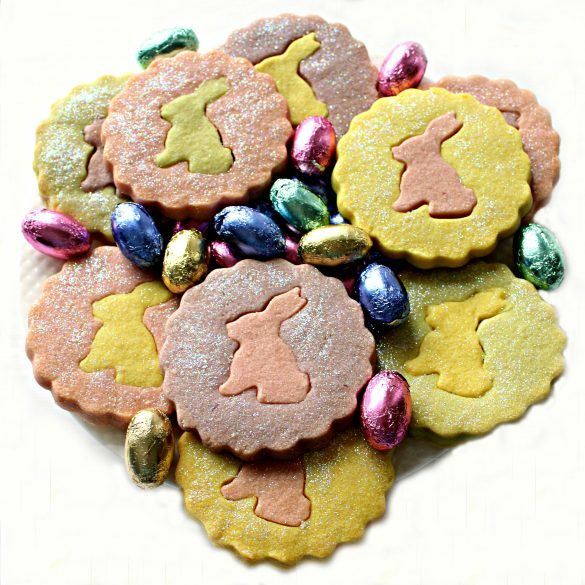 The bunnies are cut out from cookie centers and then swapped into the center of a differently colored cookie. 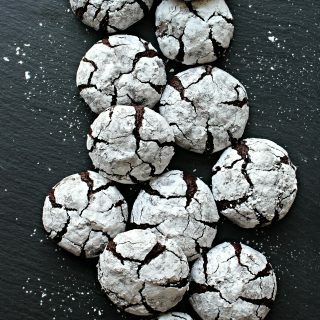 Beautifully decorative cookies with no icing required! Using an electric mixer, combine grated, cold butter, sugar, salt, and flour until a grainy mixture forms. Mix in the egg and vanilla to form a pliable dough. Divide the dough into 4 portions and color each portion a different color using powdered or gel food coloring. Shape each dough portion into a disc, wrap in plastic wrap, and refrigerate 1 hour to overnight. Roll out dough and cut out 3″ circles. Cut bunny shapes out of the center of each circle. 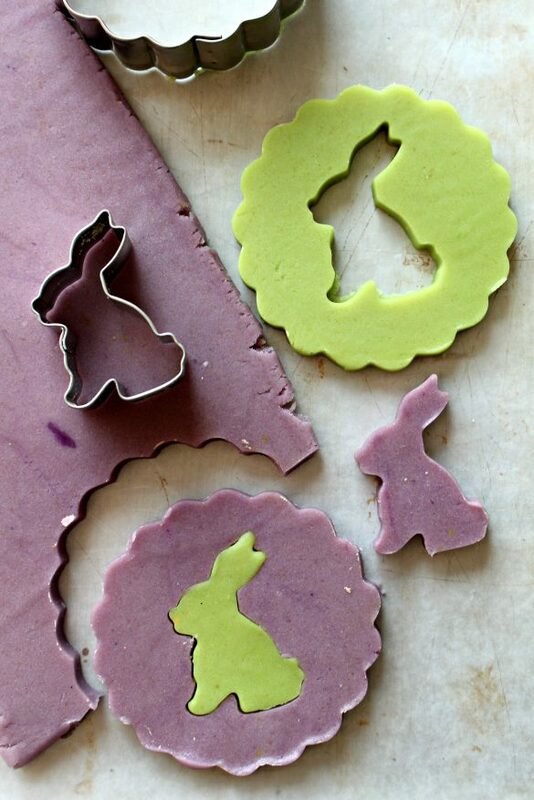 Insert the bunny shapes into the cut out of differently colored cookies. After baking, brush with edible glitter for a magical touch. 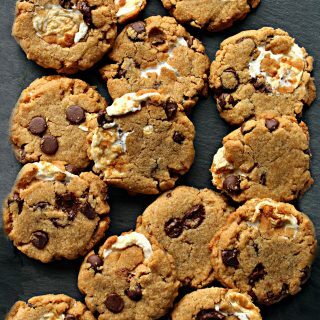 This recipe calls for grated butter which is important for the texture of these cookies. Grated butter incorporates well with the other ingredients and helps lift and form flaky layers. 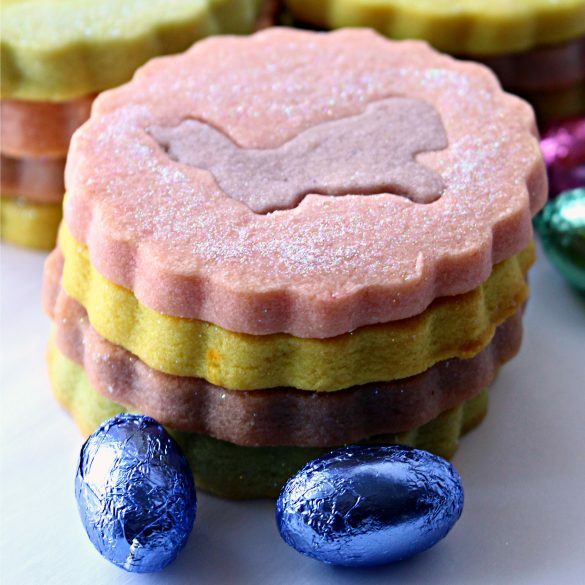 The lovely soft pastel colors of these cookies comes from natural food coloring powders. Don’t skip the chilling of the dough in the fridge and freezer. Chilling make the dough the right consistency for rolling cutting and manipulating the cut pieces. Chilled cookies spread less in the oven. Edible glitter is optional, but magical. 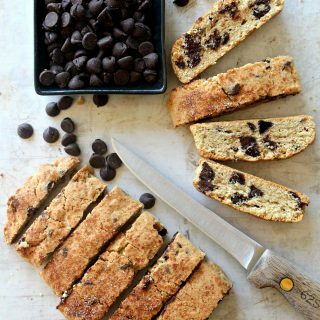 This recipe is adapted from an Imperial Sugar shortbread recipe. It makes sense that a sugar company would have a lot of experience with baking sweet things! I’ve enjoyed their recipes before ( Cinnamon Snap Cookies) and was equally happy with this shortbread cookie recipe. 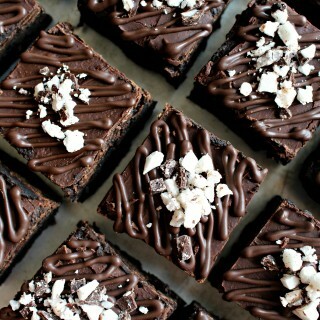 Bake some. You’ll be delighted too! Use a box grater to grate the cold butter into the bowl of an electric mixer. Add sugar, salt, and flour. Mix on low speed until a course, grainy mixture forms. Mix in egg and vanilla to form dough. Divide the dough into 4 even portions. Color each dough portion a different color. Form each colored portion into a ball and then flatten slightly into a disc. 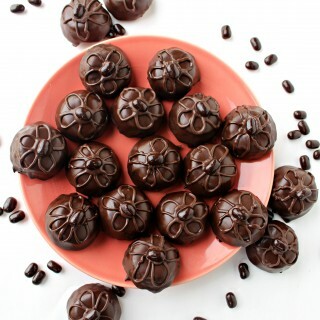 Wrap each dough disc in plastic wrap and refrigerate until firm, 1 hour- overnight. Roll one colored dough disk to ¼” thickness between two sheets of parchment or wax paper. Cut out cookie circles. Place the cookie circles on the prepared baking sheet and place in refrigerator to firm while the other colors of dough are prepared. Repeat with all four dough colors, rolling to ¼” thickness, cutting out circles, and placing the circles on the baking sheet in the refrigerator. 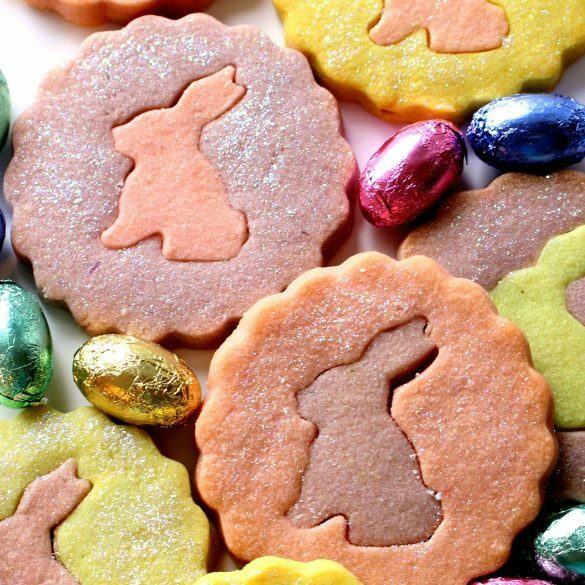 Remove the cookie sheet from the refrigerator and use a small bunny cookie cutter to cut a bunny shape out of the center of each cookie. Arrange the cookie circles about 1” apart on the prepared baking sheet. 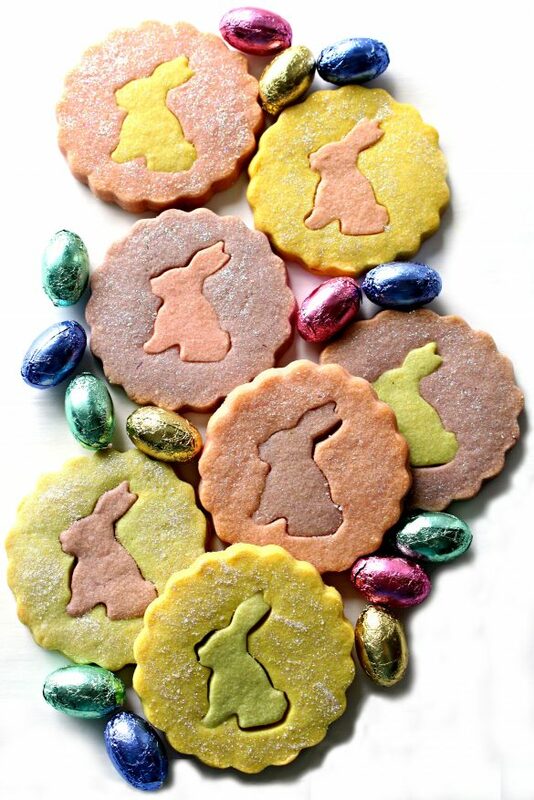 Gently insert the bunny cutouts into the center of differently colored cookie circles. If at any time the shapes become too soft to handle easily, place the cookie sheet into the freezer briefly to firm the dough. To add edible glitter: Use a fingertip or small brush to dampen the top of each cookie with water, then sprinkle with edible glitter. Bake for about 12-16 minutes or until bottom edge is just beginning to turn golden and the cookies are firm to the touch. Remove from the oven. Cool on the baking sheet for 10 minutes before moving to a wire rack to cool completely. The slightly more crumbly texture of these cookies is made more sturdy for shipping by wrapping pairs of cookies in plastic wrap. Stack the cookie bundles in a column in a freezer weight zip lock bag. Remove as much air from the bag as possible before sealing. I need to get some natural food colouring. The colours are really lovely. 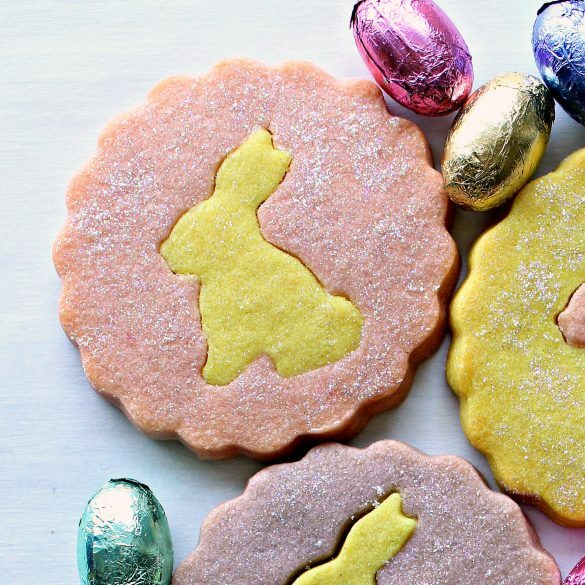 The adorasble quotient on these little bunny cookies is sky high! !